× 3 = 3 Required Please enter the correct value. The U.S. Federal Reserve was the main reason for last week's rally. As expected, the central bank left interest rates unchanged at near-zero levels. Policymakers also lowered their projected number of interest rate hikes this year to two from four. But one of the greatest risks are global central banks themselves. Many central banks are in full-on easing mode and have slashed their country's interest rates into negative territory. Major banks like the European Central Bank and the Bank of Japan are two examples. Smaller ones in Sweden, Switzerland, Norway, and Denmark are all also toying with negative rates. "Central banks continue to manipulate market-moving pawns across a chess board," Gilani said. "And by pawns I don't mean economies, I mean equity market prices for banks, bank debt, and sovereign debt. What is surprising is how blatant central bankers are becoming about the manipulation." Gilani describes these conditions as an "extend and pretend game as manufactured by central banks." These low-quality stocks were hit hardest earlier in 2016 because of falling oil prices, extremely volatile markets, and recession fears. Most worried that these least-profitable companies as measured by return on equity wouldn't survive. But these stocks, and the overall market, still look vulnerable despite the recent rally. Just look at the fact that the U.S. economy is only expected to grow at a tepid 1.9% in Q1 2016. The recent rally also came on light volume. And many attribute the gains to nothing more than short covering. According to Gilani, the broader markets will tread lower because global economic growth is anemic, valuations are stretched, and the world is facing a barrage of political and geopolitical uncertainty. Consumer sentiment is also at the lowest level in nine months. Last Friday, the Michigan Consumer Sentiment Index fell from 91.7 to 90. The move, according to analysts, was driven by fears of a weaker economic environment. What scares Gilani right now is that the global markets' rally looks eerily similar to the optimism we saw in the spring of 2008. "So long as investors believe central banks aren't out of ammo and are going to keep firing their bazookas, markets will grab hope that all the weak links can be fortified long enough for some kind of growth to get us out of this negative loop spiral," Gilani said. "[But] that's not going to happen." 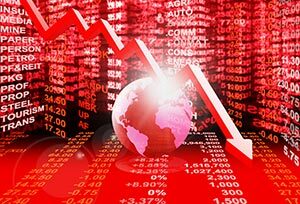 Just like in 2008, markets can keep on rallying until the bottom drops out and we reach a stock market crash. Gilani says the predominant sentiment is once again bad news is good news. "Things are so bad that they're going to get better because the central banks will make them better," he warns. "That's the 'buy the bottom, here come the fire hoses' mentality prevailing right now." Gilani said we will test the lows again in a month or two, or maybe over the summer. He also believes we may not have actually reached a bottom in oil prices. Propelling oil prices in recent weeks are simply rumors of slowed production. If the Dow can stay at about the 17,500 level, according to Gilani, February lows may well be long behind us. Still, for investors with short positions, they could turn around. "We've got a window through March 25, which by my time-cycle analysis calculations could mark the end of this rally," Gilani said. "It's tough facing the wrong end of a bull, but I've been here plenty of times before, and I've never failed to turn a setback around and ring the register," Gilani shared. How to Protect Your Wealth from Negative Interest Rates – Central banks could trigger NIRP at any sign of an emergency, putting your portfolio at risk. Here we have two recommendations to hedge against negative rates – and grab some upside, too. The Worse the Markets Get, the Better This Tactic Performs – Anybody who follows regularly what to buy and sell has had the opportunity to bank a string of double-digit returns that positively crush the markets. We show you a tactic that lets you maximize these profits here. Now's the Best Time to Buy Gold in Five Years – As central banks continue to destroy the global financial system, gold has given us an incredible buying opportunity. Here are tips on how to stock up. Stay informed on everything stock market crash related by following us on Twitter @moneymorning or liking us on Facebook.